Home Income Tax Income Tax Return Preparation Service at your Doorstep! - Individual and HUF taxpayers: Relax, take the help of Return Preparers. Income Tax Return Preparation Service at your Doorstep! - Individual and HUF taxpayers: Relax, take the help of Return Preparers. Now filing Income Tax Return is convenient than ever! Thanks to the taxpayer friendly initiatives of the Income Tax Department. 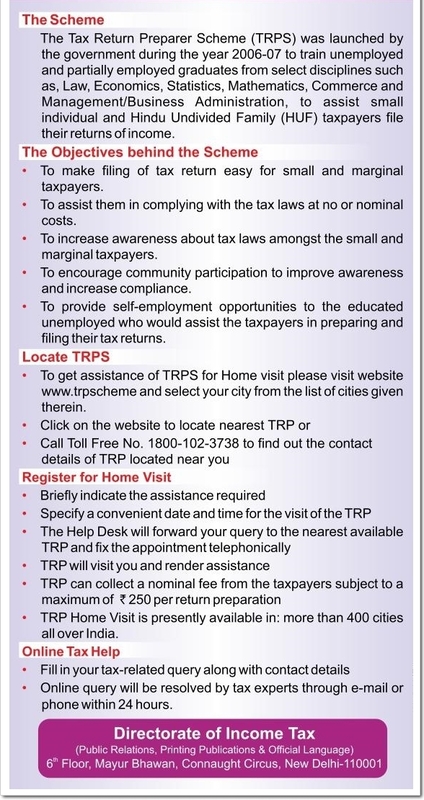 Just log on to www.trpscheme.com and choose 'Locate TRPs' or 'Register for Home Visit" or 'Online Tax Help' and a trained Tax Return Preparer (TRP) will help you in the Return Preparation process. 3. If You know your city PIN Code, Enter on Pin Code filed, If you don't know, just leave it. 4. Click on Search button. 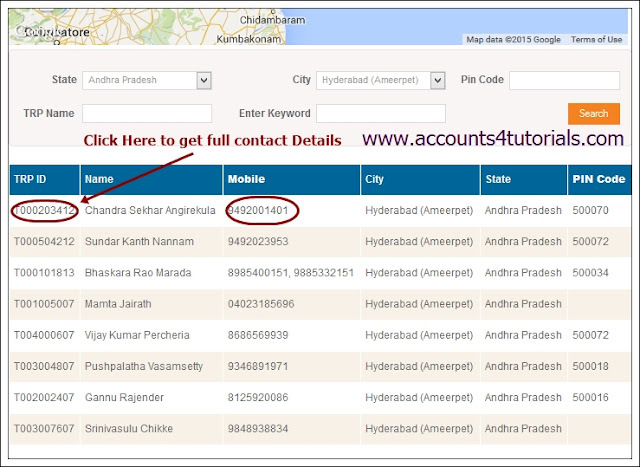 Now You can see all Income Tax Service Providers list, which were located in you town. Click on TRP ID Ref Number, then you can all Service Providers contact Details. Please note that the facility of Home Visit is brought to you by TRP Scheme, in which you may request a TRP to visit to your place on scheduled date/time to file the ITR at a nominal fee. Once you submit the Home Visit Request, you will be contacted by us, shortly. Enter All Information, then click on "Submit" Button. To assist small and medium taxpayers in preparation of their return of income and other income tax related issues, the Government of India has designed the Tax Return Preparer Scheme (TRP Scheme). Under the TRP Scheme, the Government of India authorizes tax professionals called as the Tax Return Prepares (TRPs). The Scheme is managed by the Income Tax Department. The Tax Return Preparer Scheme (TRPS) was launched by the Government during the year 2006-07 to train unemployed and partially employed graduates from select disciplines such as, Law, Economics, Statistics, Mathematics, Commerce and Management/Business Administration. What is the objective of TRP Scheme? The objective of TRP Scheme is to reduce the cost of compliance for taxpayers and encourage them to comply with tax laws. The scheme also aims to create awareness about the tax laws amongst small and marginal taxpayers and to encourage community participation to improve awareness and increase compliance. The scheme also provides self-employment opportunities to unemployed graduates who would assist the taxpayers in preparing and filing their tax returns. Who can act as a TRP? Candidates between the age of twenty-one (21) and thirty-five (35) years of age who are having a bachelor's degree from a recognized university in Law/Economics/Statistics/ Mathematics/Commerce/Management Business Administration can apply for qualifying as a TRP. Who can avail the service of TRP? Any Individual/Hindu Undivided Family (HUF), who is resident in India and whose accounts are not required to be audited under section 44AB of the Income-tax Act, 1961, or under any other law for the time being in force can furnish his Income Tax Return after getting it prepared through a TRP. A revised return under section 139 (5) can be furnished through a TRP only if Original return was furnished through same or any other TRP. Returns in response to notice under section 142(1)(i) or section 148 or section 153A cannot be furnished through a TRP. From where can locate my nearest TRP? 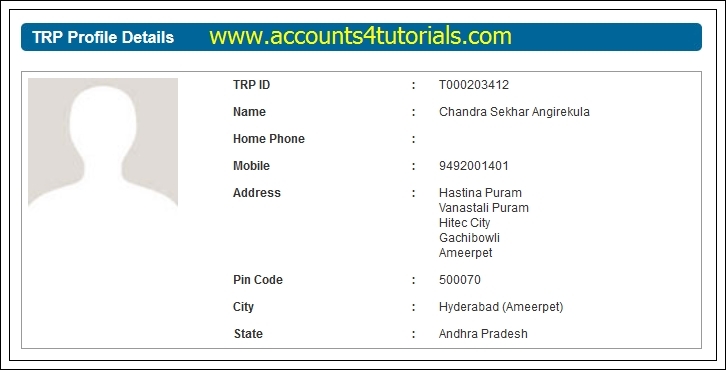 Logon to www.trpscheme.com to locate your nearest TRP or call the Toll Free No. 1800-10-23738 to find out the contact details of TRP located near you. Can I request a TRP to visit at my home and assist me in tax related issues? Contact the TRP help desk at 18001023738 and briefly indicate the assistance required by you. specify a convenient date and time for the visit of the TRP. 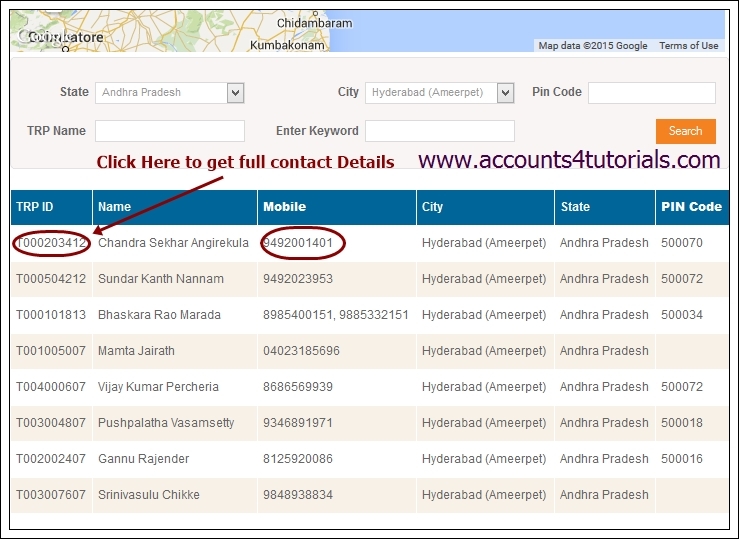 The Help Desk will forward your query to the nearest available TRP and fix the appointment telephonically. TRP will visit you and render assistance to you. TRP can collect a nominal fee from the taxpayers subject to a maximum of Rs. 250 per return prepared by him.